Sri Venkateswara Vedic University Admissions to BA, MA,M.Phil, Ph.D Courses Admission Notification 2016-17. Applications are invited from the eligible regular candidates for admission into Traditional Courses Sastri(B.A. 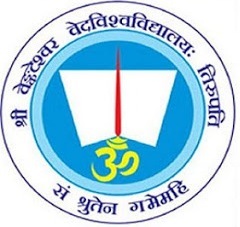 ), Acharya(M.A), Visishtacharya(M.Phil.) and Vidyavaridhi(Ph.D.). The application form and prospectus can be obtained in person, free of cost from the undersigned or can be downloaded from the University website www.svvedicuniversity.ac.in. Admissions are based on the Entrance Test and knowledge of Sanskrit is essential for all courses. The last date for receipt of the filled-in application Sastri and Acharya Courses in the office is 1-6-2016. Last date for Visistacharya (M.Phil) and Vidyavaridhi (Ph.D) Courses is 15-6-2016. SV Vedic University - Admissions to BA, MA, Diploma and Certificate Courses 2016 http://www.svvedicuniversity.ac.in/. In addition to free accommodation, boarding and clothing substantial cash incentives will be given to each student admitted for traditional Course other than M.Phil. The last date for receipt of the filled-in application Sastri and Acharya Courses in the office is 01-06-2016. Last date for Visistacharya (M.Phil) and Vidyavaridhi(Ph.D) Courses is 15-06-2016. Contact Ph.No:09000688969, 0877-2264651, 9492184039, 8330938742, Tirupati.